Artists join hands with a revolutionary state to not just make images of a new world, but to make art that will help create a new world. An exhibit at the Art Institute of Chicago features the artistic outpouring of Russian artists after the October Revolution of 1917, the coup that brought the Soviet Union into being more than a century ago. Matthew Witkovsky, Sandor chair and curator of photography at the Art institute of Chicago: The first thing that a visitor would see at the center of the opening room, it’s a poster the artist El Lissitzky made to say to people “Wake up!” If things don’t seem familiar that’s cause you’re entering a new world. Phil Ponce: “Beat The Whites With The Red Wedge,” a poster celebrating the success of the Bolsheviks in the Russian Civil War, is one of 550 pieces in the largest show of Soviet Art in the United States in a quarter century. Ponce: There are paintings, books, posters, photographs, sculptures, even product design and gum wrappers. All of it was made after 1917 and all of it in service to the new Communist state, the Soviet Union. It was faced with the herculean task of transforming a feudal society into a modern industrial nation. El Lissitzky. “Beat the Whites with the Red Wedge,” 1920. Ne boltai! Collection. Vladimir Stenberg and Georgii Stenberg. “The Mirror of Soviet Society,” cover for Red Field, no. 19 (May 1928). Ne boltai! Collection. Art © Estate of Vladimir and Georgii Stenberg/RAO, Moscow/VAGA, New York. 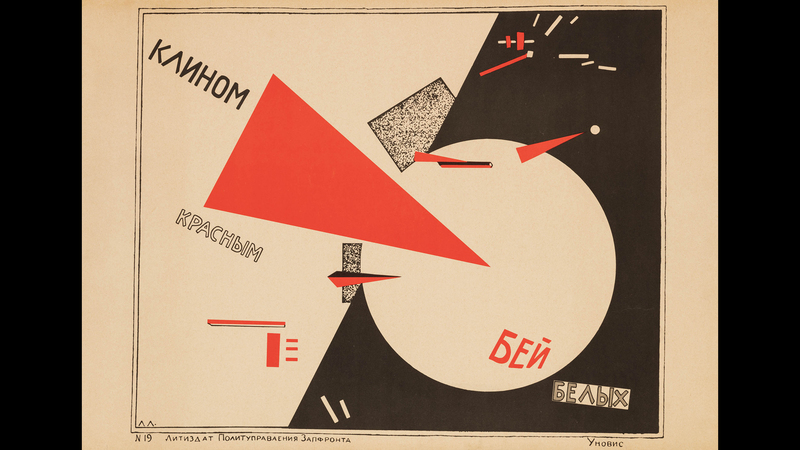 El Lissitzky. “Photomontage for the International Hygiene Exhibition, Dresden,” 1930. Alex Lachmann collection. Arkadii Shaikhet. “Lenin’s Light Bulb,” 1925. The Art Institute of Chicago, restricted gift of Joyce Chelberg. © Arkadii Shaikhet Estate, courtesy of Nailya Alexander Gallery, New York. Witkovsky: How do you remake a country radically overnight? Russia was 6,000 miles wide, had a 130 million people and they spoke dozens of different languages. The Soviet revolution demanded of all Russian citizens that they think, and not accept the state of affairs in the world as natural or given. The artists were part and parcel of this revolution. Ponce: Artists were key players in the Soviet Union’s new mass media, designing newspapers, magazines and propaganda pieces. Witkovsky: The movie camera, the newspaper, the telephone, the typewriter. All of this was pretty much new in early Soviet Russia. Ponce: Trains traveled the country carrying newspapers, theater groups and movie theaters in boxcars. Witkovsky: They’re coming together and they’re watching films that were used to bring news and information to the population, newsreel cinema. Ponce: A room in the exhibition is a reconstruction of a prototype for a workers club that the artist Alexander Rodchenko. Witkovsky: And Rodchenko says if you’re going to have a social space that space should be fully thought out so that every last part of it helps us to understand what a revolutionary society we live in. There’s a platform in Rodchenko’s design that workers climb up with a ladder and hold a puppet show or they could give a lecture. Ponce: Another room in the exhibition is a reconstruction of a small art gallery by El Lissitzky. Witkovsky: You’ll notice that the walls seem to change color. That’s because they are made of wood slats that are painted white on one side and black on the other and grey on their face. He wanted to create a space where visitors would feel that they themselves had a role in bringing meaning to the art. Ponce: A key artist in the show is the Latvian-born Gustav Klutsis, whose beginnings in the Soviet cause were not the path most would think an artist would take. Witkovsky: Gustav Klutsis served in the revolutionary army as a rifleman. Ponce: The exhibition includes many drawings Klutsis made of eye-catching portable communication kiosks. Witkovsky: They could show films, they could be used to sell newspapers and magazines, they could even give people the space to deliver the news in person. Klutsis never built these kiosks. He put them forward as ideas. Ponce: Also included, the first Klutsis kiosk ever built, and it shows films! Witkovsky: Klutsis went on to make fantastic propaganda posters using photo montage. Ponce: In one, Klutsis includes an image of himself posing as a miner. Collages were a favored form. Witkovsky: Many artists argued that collage as an art form helped in the process of thinking because it was made of parts that were put together. And so it operated the way our minds should operate. Taking bits of information and trying to make sense of the world around us. Ponce: Klutsis enthusiastic participation in creating art for the new society did not end well. He was a victim of the Stalin-era purges of the 1930s. Witkovsky: The exhibition includes a drawing made by Klutsis’ partner of the moment when Klutsis is led away by the secret police who then kill him some weeks later. Note: This story first aired on “Chicago Tonight” on Dec. 19. The exhibition “Revoliutsiia! Demonstratsiia! Soviet Art put to the Test” is at the Art Institute through Jan. 15. Dec. 11: Exploring the connection between a controversial painting at the Art Institute and the new play “Red Velvet” at Chicago Shakespeare Theater. Dec. 5: The Christmas season is the only time to see a rare Nativity scene that blends both spiritual and earthly pursuits. We go for a look. March 22: The Art Institute of Chicago unveils new galleries of medieval and Renaissance art – including the re-installation of the popular arms and armor collection. We get a sneak peek.